When we were given this assignment I immediately thought that this was going to be bad. When we went over what these virtues meant in class, I realized how specific and broad they are. I would say that it is practically impossible to follow all of these. The ones that I found most difficult to follow were temperance, silence, and moderation. I overeat all the time so in order to follow temperance was just too difficult. I broke moderation many times, which is to keep a level head. During basketball, I lost my cool multiple times a game so that just went very bad. One that I found I hardly every follow is cleanliness. My room is always a mess, even when I say I am going to clean it, I don’t. I don’t think it is fair to say that I am not a good person though because I do not follow it. In school, I am clean and follow the virtue orderly even though at home I typically do not. I think that it is all relative. As I went through the day trying to follow these, I realized why Franklin had such a hard time and gave up. Truthfully I don’t think it is fair to ask anyone to follow all of these at once. If everyone or even most people followed these we would all be so similar. It would make life so boring. Not following these things to their full extent is what makes life interesting. 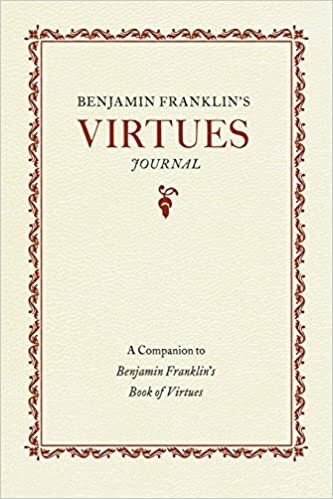 Franklin had such high expectations for himself, which I understand, but I don’t think he even realized how difficult it would be to follow them. Once he figured out how hard this would be, I think that he realized it wasn’t possible for everyone to follow it, especially if he couldn’t. Overall I learned that it is not possible to completely follow all of these virtues. Instead, you should just try to follow them sometimes and do your best to be a good person. In the end, as long as you are trying your best that is all that matters.